Just over a year ago I was handed a DVD by a friend and told, "you need to watch this." It was a documentary film called "The Price of Sugar." The protagonist in the film is Fr. 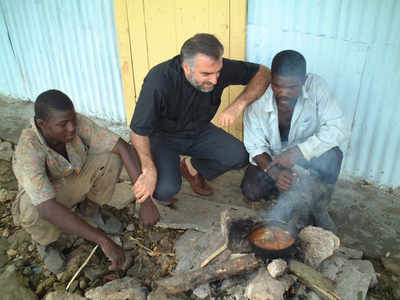 Christopher Hartley, a half British, half Spanish priest who ended up serving as the pastor of a parish in rural Dominican Republic. One of the main agricultural products produced in the Dominican Republic is sugar cane. Large corporations own huge plantations and hire local working class people to harvest the cane. Fr. Hartley discovered that the catchement area for his parish was made up of many of these plantations. His parishioners were the cane cutters. What's more, Fr. Hartley discovered that a great number of his parishioners were living in deplorable conditions. The film follows Fr. Hartley's work among and for his parishioners, his push to help improve their living conditions and to tell the world what happens on Dominican sugar cane plantations. I spoke to Fr. Hartley by phone from Spain about his time in the Dominican Republic and the push to have Dominican courts recognize the rights of the cane cutters. I also spoke to Elizabeth Abbot, a writer from Ontario who has written a book about the history of the sugar trade. Incredibly, from the moment sugar was "discovered" by the upper and middle classes, the industry has been an exploitative industry. Elizabeth shared some of that history with me, as well as her tips on how to have your cake and sweeten it too, ethically. You can catch our conversations on Catholic Focus: Looking at The Price of Sugar, this Wednesday September 29th at 7pm ET/8pm PT, with an encore presentation Saturday, October 2nd at the same times. For more information on the film, visit The Price of Sugar, or www.elizabethabbott.ca for more on the book Sugar: A Bittersweet History.